Police have defended an officer who was filmed dropping a magazine clip from his weapon while attending the scene of a sudden death in Lurgan. 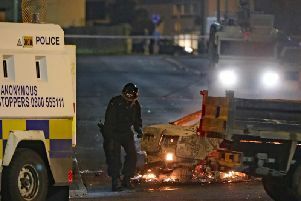 The PSNI said the magazine release on the gun caught on his ballistic vest inside the police cordon. The mag and one bullet fell to the ground but both were quickly recovered. The incident was caught on camera by a by-stander at the railway crossing in William St last Thursday where a young man died after being hit by a train. Sinn Fein MLA John O’Dowd referred the matter to the Police Ombudsman. Referring to the video PSNI Craigavon said on Facebook: “Part of our job, sadly, involves carrying firearms to counter the terrorist threat we face on a daily basis, and to protect the public from those who would do them significant harm. “A guy had his girlfriend in a headlock, threatening to cut her throat. The same officer had his gun drawn and, when a nice mixture of verbal commands and CS spray got the blade away, he was first on the suspect to restrain him and save the girl’s life. Having handcuffed the suspect, he then threw up on him due to CS effects. “We had containment on a house where two suspects were holed up after an attack involving a meat cleaver and a knife. They tried doing a runner out the back...where we were waiting. Again, guns drawn, verbal warnings, suspects on the deck and cuffed quickly. “They were real public safety issues, ones dealt with robustly and professionally. “Yes, occasionally human beings, even specially trained ones, drop things. Even mags from guns (which we have to carry due to the terrorist threat) when the release catches on our ballistic vest (which we have to wear due to the terrorist threat) inside a police cordon. That’s not to mention the fact that the guys that night were dealing with one of the most harrowing incidents we face. One mag down, one bullet out, both recovered quickly. “Thanks to the onlookers who spotted the same thing as another one of our guys did and made sure that this dramatic dropping of an object lasted for all of five seconds, and that the scene of a man’s death was captured on video for everyone to look at for years to come. “If you have concerns over actual public safety issues in your area, call 101, or PM us. Mr O’Dowd said: “The officer in question is seen on patrol when he drops what appears to be a magazine clip from a rifle. He picks it up but is called back by young people to pick up what they claim are bullets left on the road.